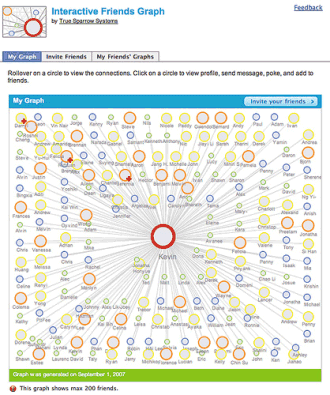 Interactive Friends Graph Map, a Facebook app. Image licensed as Creative Commons by inju. You probably remember the post about Socialstream, a Google-sponsored project that tried to "rethink and reinvent online social networking". The result was a meta-social network that aggregates data from other community sites using APIs and whose goal "is to present social information in a way that ties it to the person who posted the information, and not the site from which it came." Since last year, Google was busy developing plans for a set of APIs that would make it possible to communicate with other social networks. Brad Fitzpatrick, who moved to Google from Six Apart, wrote an interesting article "Thoughts on the Social Graph" that tackled this problem. "Unfortunately, there doesn't exist a single social graph (or even multiple which interoperate) that's comprehensive and decentralized. Rather, there exists hundreds of disperse social graphs, most of dubious quality and many of them walled gardens." His solution was to make this database of social connections a "a community asset, utilizing the data from all the different sites, but not depending on any company or organization as the central graph owner." Even if this will not bring Brad's vision closer to reality, Google will launch tomorrow OpenSocial, "a set of common APIs for building social applications across the web". According to a still-unofficial press release, "OpenSocial gives developers of social applications a single set of APIs to learn for their application to run on any OpenSocial-enabled website. By providing these simple, standards-based technologies, OpenSocial will speed innovation and bring more social features to more places across the web." The APIs give access to a user's profile, their friends, and the activity streams. The success of Facebook's platform, that has more than 5000 applications, made a lot of social networks consider the launch of similar platforms. But not many developers would develop different applications for each social network, so smaller sites will have less visibility. orkut, Google's social network, has more than 70 million users, but only 18% are in the US. While it would've been easier for Google to just open up orkut, this common set of APIs will make the social applications more valuable because they can run in many other places and can access data from other sites. Google's social APIs should be available at code.google.com/apis/opensocial (the site is not live yet). The initial social networks and companies that support the APIs are orkut, hi5, Friendster, LinkedIn, Viadeo, Ning, Salesforce, and Oracle. It will be interesting to see if other social networks decide to join Google's efforts. 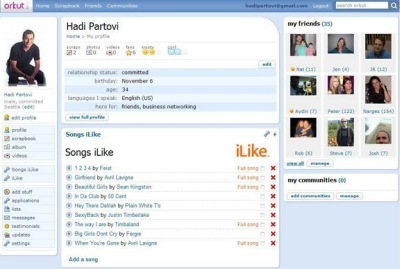 MySpace announced that will open its platform in the next months, but it's unlikely to use Google's APIs. "The timing of OpenSocial couldn't be better. Developers have been complaining non stop about the costs of learning yet another markup launguage for every new social network platform, and taking developer time in creating and maintaining the code. Someone had to build a system to streamline this (...). And Facebook-fear has clearly driven good partners to side with Google," writes TechCrunch. And Google also has a financial incentive to build this open platform. "A person familiar with Google's efforts said that those applications have been far more effective for advertisers on social networks than users' personal pages," reports the New York Times. Google tried to convince "third-party developers with applications on Facebook to run Adsense ads within applications pages". Update: MySpace joins OpenSocial. "MySpace says they are abandoning their efforts to create their own markup language (which is what Facebook has done) and direct APIs will go exclusively with OpenSocial." Other social sites that join Google's efforts: Bebo and Six Apart. It seems that everybody except Facebook will be in this coalition. Update 2: "As the most trafficked website in the country and the most popular social network in the world, MySpace is one of the leading forces in the global social Web. We're thrilled to grow our strategic relationship with MySpace by joining forces on this important initiative," said Eric Schmidt. Google's press release is mostly about MySpace and its "commitment to supporting standards that foster innovation in an increasingly social Web". That's a welcome change from MySpace. I think OpenSocial will be more successful in communicating networks. Google Open Social = Google OS? Great summary. It'll be interesting to see how it unfolds. I've actually started an "open social blog" to follow the story. OpenSocial is sure going to cause a revolution in the social networking arena. I believe its still in quite a nascent stage, but with so much momentum behind it, it should grow fast into becoming the default social network platform. I believe it is still in doubt as to whether or not OpenSocial will lead to an accelerated evolution (or revolution) or stagnation. hey any one can help me in google opensocial Api in that i want to access the message part such a way that i can send a message to any person in orkut. so, please give u r ideas and facts about opensocial API that how can i access to the primary email of the perticular user. OpenSocial is a total farse. It is neither open nor social. Every platform implements takes and ignores what they want from the spec. Its over-complex and solves non of the problems that it should solve. Facebook's platform is 10 times easier and more robust. Can you implement a login system on your site using OpenSocial? I know that you can build an application using OpenSocial, but is there a way to use their authentication system?